Six years and still getting reports that the fix is still helping others get the most from their hardware! Please keep the comments coming as I love reading the success stories! By popular demand, here's a couple of how-to links on editing the registry. Thanks for the kind works and be sire to read thru the feedback comments below for updated and improved information. I have long since retired the laptop so I can't offer new info or insight, but I love hearing the success stories! I am gobsmacked that this site is still getting traffic and still helping people get the most from their bluetooth. Thank you so much for the updates and feedback on working configurations as you discover them. Please keep the comments coming- they make me happy knowing others are still benefiting! For those running Toshiba's bluetooth stack and encountering the infamous 'License has expired' message, I have a workaround that seems to be working. "Bluetooth Manager: Thank your for evaluating the Bluetooth Stack for Windows by Toshiba. The evaluation period has expired. 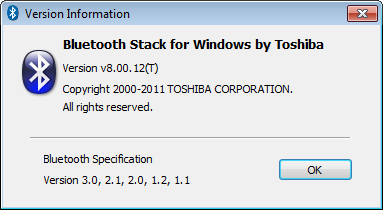 Please obtain a license for this version of Bluetooth Stack for Windows by Toshiba." I did a little digging and found that this was quite common. Now, my BT adapter from Dell in my Inspiron 9300 is made by Toshiba. I used the last version of the stack without problems. So...I want my BT back. Simple fix- edit HKEY_CURRENT_USER\Software\Toshiba\BluetoothStack\V1.0\Mng. Add a new DWORD key called TestVersion. Set it equal to 1. Message gone. This key will probably have to be added to each user account on the computer that need BT functionality. I've been looking for a solution to this for ages. And, looking at all the other pleas resulting from my Google searches, so have many others. It works on my 5 year old Sony Vaio AR 21S (so far), which came with Windows XP, but labelled "Vista Ready". I updated to Vista and it worked ok, but when I installed Windows 7 - no more BT. I found the driver on the Toshiba Portal, but then got the 30 day message. This tip is a little gem. Thanks for posting it for us. It really needs to appear at the top of the Google Search. I'm glad I could help. And I'm glad to know it's working for someone else and wasn't just an isolated fluke. Does this just disable the pop-up or does it actually allow the BT to work after the 30 days??? This could be life-changing!! I'm thinking that it is an old evaluation hook that toshiba added for vendors/debugging. The software works fine with no issues. Been stable since the original post date (12/12/2011). Almost a year now. The 350 gives the expire message to any laptop bought with vista...older xp models have a toshiba licence in the firmware, so this message can also be fixed if you down grade the 350 module with older firmware there is a link and expanation at the bottom of this dell forum page . Interesting, DB. What a PITA. I really wouldn't have too much issue with this fact (Toshiba not liscensing the stack with Dell BT modules in Vista) if they offered the BT stack for purchase as an option- but they have shut that option down, leaving us with legacy hardware that isn't legacy. Toshiba got their license fees when we bought the laptop. Just because we upgraded to a different OS should not be a reason for them to lock us out. Sorry...I rant... I appreciate the insight. This might prove useful in the future. My thoughts exactly Mike. To disable a top-end laptop after a few short years, for the sake of a license fee for one tiny component in that laptop (which they won't let you buy) is a sad reflection on Toshiba. And, in my case at least, Sony, for going along with this. If you hadn't posted this fix, and I had found DB's alternative fix, then I'd have used it. But why drag your device back several generations in FW, just to get some utility from that device. Why not make use of developments in the latest FW / Driver? I really appreciate you posting this tip. It worked for me on my Acer Aspire 5532 Windows 7 64-bit laptop. It doesn't have bluetooth built in so I got a Bluetooth mini usb adapter and the only driver that would work is the Bluetooth Stack for Windows by Toshiba. It worked great until the 30 days was over. I tried several other drivers and none worked. I reinstalled the Toshiba version and immediately got the 30 day message. I was furious. I narrowed down my google results to just the last year and your link came up on the first page. Thanks so much! Does this edit just disable to pop-up or will the BT actually work after the 30 days?? It just works. Been working for me for over a year. Great to hear, ChasSquirrel. Glad I could help out. Thank you for your help! This worked perfectly!! Doesn't work on Windows Server 2008 R2 with the version 7 Toshiba drivers. Tried installing the version 8 drivers and they don't seem to work at all. The version 7 drivers worked until the trial expired. I'm sorry to hear that. Maybe someone will figure out a fix and help you out. Super! Thank you for your help! Glad to hear someone else has been helped. I never imagined the traffic this fix would generate! You solved very clearly. No problem anymore.. Tried it on Windows XP no luck any other suggestions? You are the only one I have heard from that has not had success. I would double-check that you are in the right location in the registry and using the right kind of key (DWORD). Other than that, there is another possible (untested by me) solution a couple of comments down below. This is great to hear! I'm glad I could help. Interesting. Thanks for the find. Can anyone else confirm this? I am guessing this is an alternative to the registry change? Probably changes the hex value that the software is looking for from the registry? Glad to see this page still helping others out! Same issue. How I dislike Toshiba more each day! Add a new DWORD key called TestVersion. Set it equal to 1. Message gone. Do I highlight "Mng: then EDIT > NEW > KEY and enter "TestVersion"? If so not sure of the proper command to set it equal to 1? Yes- create a new DWORD key, rename it to TestVersion. Double-click on it and change the value to 1. Thanks a lot! Toshiba stack finally get worked! Haha- that's true. That way never crossed my mind. If I find time, I may need to add a downloadable. Thanks for the idea! but I still has the msg in the notification bar ' the evaluation period has 20 days remaining ' !! I'm sorry, Enas. I don't have any other suggestions other than to double-check the registry changes and make sure they are in the correct location. It's been so long, I don't know, but IIRC the change doesn't go into effect until after a reboot. Just a thought in case you haven't. Good luck! Personally I wouldn't consider Toshiba and that's why I have ended up looking for your solution - THANK YOU MIKE!! Worked like a charm. I would have happily bought a license from Toshiba, but since they're not offering.... we gotta do what we do!!! Amazing fix. I had been looking for months, given up, and next time I looked I found this post. Thank you! Thank you a thousand times for your patch for the Toshiba Bluetooth stack. Apart from the angst of trying to install and configure different Bluetooth chipsets and obscure drivers, I have also spent the last 3 days (and nights) looking for this 'expiration' fix, and your post finally appeared. Congratulations on your work! Most excellent! Thanks! Another satisfied user - now I can continue to use the tiny, cheapo generic Bluetooth adapter I got from Ebay. Wow! Thank you so much! Extremely helpful! And I concur with JimK...I had the exact issue! Would you mind giving some more instructions? It's not hard, but if you have never done anything related to editing the registry, I suggest you spend some time researching on google. Wow, this was extremely helpful, thanks so much! Wish I knew about this years ago. Like many noobies I thought you had to have to have a Toshiba Computer and Toshiba Bluetooth adapter. Nope. I use this on Win7 with HP x64 PC with GlovePie, FreeTrack and Wii Remote. Excellent!! Thanks for the hack!! I upgraded my OS to Windows 7 and after spending 3 days trying to find a working stack for my Sony Vaio UX-390N, I kept getting the same message (30 day trial). Performed the edit and Presto!! Yea!! I knew there had to be a registry edit for this timer but wasn't sure what it would be called. Works great for version 9.10.01. I've been having this issue, just did what u suggested, without even restarting my computer ( had to reopen the app) it works again! Just had to jump in and add my thanks to Mike! For those that are trying this method, once you make the regedit change, close the Bluetooth application and then re-start it. You should no longer see the "X" Days Pending expiry notification. Thank you again Mike and Happy New Year!!! Thank you! I did a Windows update earlier this week and it updated the Toshiba Bluetooth driver. The update didn't go well and next thing I know, my bluetooth is gone. I hunted high and low before Windows provided a download link for the bluetooth stack. Upon installing I got the famous 30 days evaluation message. I decided to see if that will cause me a problem and found this site. Your suggestion worked perfectly. Thank you! the original CSR software was giving me problems and rarely connected. I got a CSR8510A10 BT dongle and your trick helped me installing a Toshiba Bluetooth Stack that does NOT conflict with Remote Desktop Client of Windows 8.1!!! May the Force and farces be with you! FYI, the CSR Harmony 2 Bluetooth Stack caused Remote Desktop Client to crash! So, the fix worked for you on 8.1, or you thought it did, but it didn't? Had the same issue with Windows 7 and the Toshiba stack, now fixed! Over three years later, and your post is still helping people - thanks!! No one is more amazed than me! I am humbled by all the traffic this little fix has received over the years. You sir, are a wizard. This should be at the top of the Google results. Yeah! Thank-you! It works after the re-boot! Works great on my Win7 machine - Thx for sharing! i have window7 L850-B433 Toshiba laptop and this does not work. i have created the DWORD and named it TestVersion but still get the message :S.
This is a print screen of the key on my PC that works fine, check if its the same as yours, on the task bar you can see the path. it is the same but still getting the same message :S.
kindly share the zip plz. I am running Win10 pro 64 bit OS. The version I installed was the PC Bluetooth Stack 8.00.12 Windows 2000 / XP / Vista / Windows 7 x32 version and its working fine. Thanks for the update, George. Thank you very much, this was REALLY helpful. Have a great day, sir! Mike, thank you very,very much for this great tip. This still works with v9.10.32(T)! Thank you for this post! I had tried several possible solutions, including trying to edit the EvalParameters binary key (never could properly decipher it). Your solution worked perfectly on BOTH of my USB BT nubs (one Belkin, one Roadrunner) on Windows 2012 (which has NO builtin BT stack). The thing that pissed me off about the Roadrunner is the fact that their driver download page just redirects to the toshiba stack page and the stack doesn't see the nub as an authorized device and maintain the 30 day limit...SOOOO helpful! I am amazed every time I get a comment that it is still working and helping people! By Windows 2012, do you mean Windows Server 2012? My adapter was working just great. I'm a bit peeved at Toshiba. Let's just say I won't have warm happy thoughts when I see their name in the future. Thank you very much Mike!!! This work only with TOSHIBA bluetooth. I would guess it only works with Toshiba, but I don't think anyone has tested it. Thank you very much. God bless you always! Turned my cheap Bluetooth Dongle to a better range than the original software supplied. Now using 9.10.27(T)... Thank you for your guidance. Even just for a kid like me trying to use his Wii U Pro controller on PC, this is still a godsend. Mike, you are the hero this city deserves. THANK YOU! I'm so happy to have functional bluetooth from my laptop! Toshiba Portege R835-P55x (circa 2011), Windows 7, 64bit, i5, 4gb ram. Laptop didn't come with bluetooth. Installed Soundbot USB bluetooth transmitter (amazon) and bluestack v9.10.32T 81mb. For external/internal speakers(and now also bose bluetooth Q35!) I boosted audio amp/sound quality with free software called Equalizer APO 1.1.2 that I found over a year ago from another forum. Thank you very much..It worked in my windows 7. For those who doesnt know how to get to HKEY_CURRENT_USER..
1) Click Start, type: CMD. 2) Right click on CMD, then click "Run as administrator"
3) At the command prompt type "regedit" then press Enter. Thanks for the fix man. I have to use Toshiba stacks so that I don't have to enter a pin when I pair a WiiMote to my computer for playing guitar hero. I'm glad I no longer have to reinstall the program every 7 days just to use it. The guy who posted above me helped a lot too with finding the regedit program. Still amazed people are getting use of this! Great to hear you got it working! Mike many thanks for this. I finally succumbed to upgrade my old Sony Vaio from Vista to W7 and sure enough my Tosh blue tooth stack stopped functioning. Downloaded version v9.10.27(T) then followed your instructions and 'hey presto' no 30 day trial countdown. You certainly helped a lot of people with this guide. Yep, just worked for me in win7(32) with a generic BT dongle from amazon! Haven't used BT on the netbook in probably a year, decided to play around with it today, got the dreaded 30 day expiration! I am stunned that this tip is still generating traffic almost 6 years later! I love reading the comments and appreciate the feedback from everyone. Keep it coming! Well, here's another one - Mike, I really appreciate your help with this thing. I'm using Grand-X BT dongle to connect my Dualshock4 to Win7, default drivers are causing epic input lag, but with drivers from Toshiba everything seems to be a lot better. So simple, yet so effective solution. This blog has saved me so much hassle! Thank you. Running WIN 8 and didnt work. Is a restart required? Thanx man! Oddly enough, it has worked for years in the past on my Samsung R540 (Windows7, 32bit), but I bought a new bluetooth stick couple of days before and suddenly a 'license expired' popped up and the bluetooth stack stopped working. Thank you for posting this solution,that was also easy to find via Google engine, you saved my time, possibly a lot of time. I am an atheist but... May Good bless you with best of luck!! Thanks so much. I never edited the registry before but this was real easy, and still works! Thanks so much! Still working in April 2019 with Windows 10 and my old Toshiba. You are genius!